Ah, the old monster movies... Godzilla, King Kong... erm... quick, think of one involving a big wolf. Alright, I can't, but there probably is one. How great would it be if all three monsters got together in one movie? Well, the wheels have been in motion since the mid-80s, when Bally Midway released the arcade game Rampage. 3 players can play at once, each assuming the role of one of the aforementioned monsters, or rather a non-copyright-infringing equivalent. 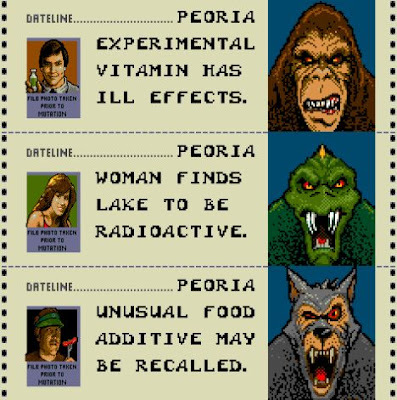 The storyline is that you are actually a mutated human, the mutation being caused by some super vitamin or a radioactive lake or something. And your aim? Well, pretty much cause as much destruction and devastation to the single screen play area as you can. Destroy all the buildings, and move onto the next screen. Sounds pretty simple, right? Well it would be, but unfortunately there's a lot of people none too happy about that. In particular, the armed forces are out to get you, with soldiers, helicopters and tanks all coming to try and take little bits off your health. Luckily, your energy bar is pretty enormous, and it'll take a fair few hits before you finally succumb, at which point you revert to your naked human form, hastily sidestepping away whilst covering your vanity. Nice touch! So, how do you bring the buildings down? Pretty simple, climb them and punch the living hell out of them. Using the joystick, you can aim your punch in different directions, so you can, for instance, punch directly upwards to take out a helicopter, or even behind you. But whilst you're on the side of a building you need to be punching either the outside walls or the windows. Once a building takes enough damage, it will start to crack, and then collapse. Unfortunately, you're probably still attached to the building, so you'd better jump off before you come down with it and receive a fair bit of damage. Luckily, there are ways to give your health a boost, people and objects appear in windows, and you can eat some of these; beware, however, that some items will actually cause you damage. A good example of this is the toaster. Try to grab it and it electrocutes you... unless the toast has popped up, in which case you will eat the toast. Clever, huh? The problem is... that's all there is to it. That's it. There's no official end to the game, you get a bonus every 128 levels, and after level 768 you go back to level 1... but this isn't a game to play score attack on. It's a game for a sharp burst of fun, a good laugh, even better with 2 friends. The high-res graphics remind me of Atari's games, but with typical Bally Midway cartooniness. But now we come full circle... the game ripping off 3 major film franchises / monsters, is set to be made into a movie itself! It's almost unbelievable. Whether it'll be any good or not, of course, is an entirely different story.